Let Us Store Your Belongings, Safe and Secure. 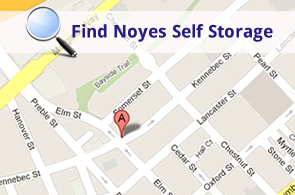 Located just off I-295 on Kennebec Street in Portland’s downtown, Noyes Self-storage is the most convenient and secure southern Maine storage facility. We offer monitored self-storage units of varying sizes for residential and commercial use. All storage space is heated, monitored and alarmed to ensure peace of mind when it comes to storing everything from family heirlooms and household clutter to important office records and equipment – vehicles too. Our covered loading dock is also available for loading and unloading to protect your items from the Maine elements. Call us or request a quote to get started. Our pricing is all-inclusive so you won’t find any surprises or add-ons.